The Union right and center are in shambles. The divisions of Sheridan, Davis, Brannan, along with separate brigades and artillery batteries have been routed and are fleeing. In addition to clogging the Dry Valley Road leading to McFarland Gap, they are also roaming the woods to the west in the foothills of Missionary Ridge. Some of the routed units have begun to rally on Snodgrass Hill and Horseshoe Ridge. Individual regiments and batteries stop and reorganize themselves around the infantry and artillery there commanded by Major General James Negley. At Kelly Field, Govan’s brigade makes an isolated attack against the north end of the Union line. 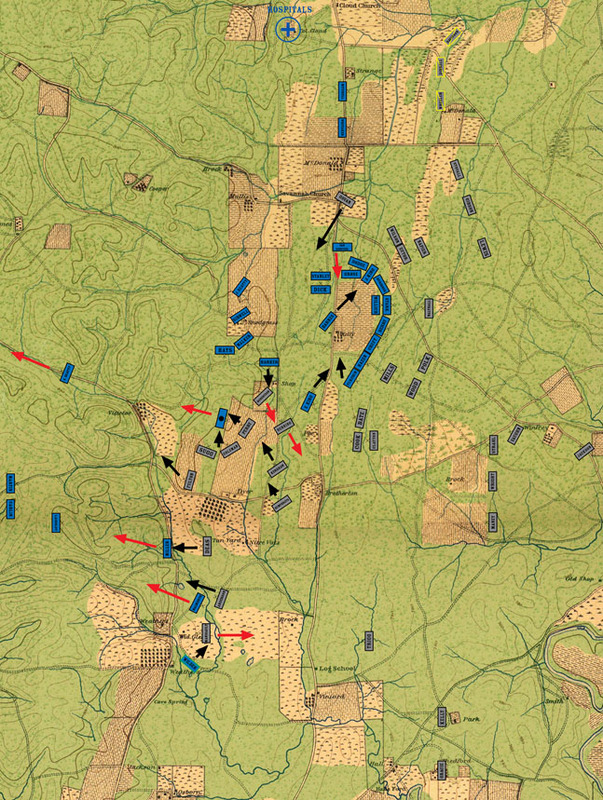 Farther north, Steedman’s division of the Union Reserve Corps deploys in the face of Forrest’s skirmishers.